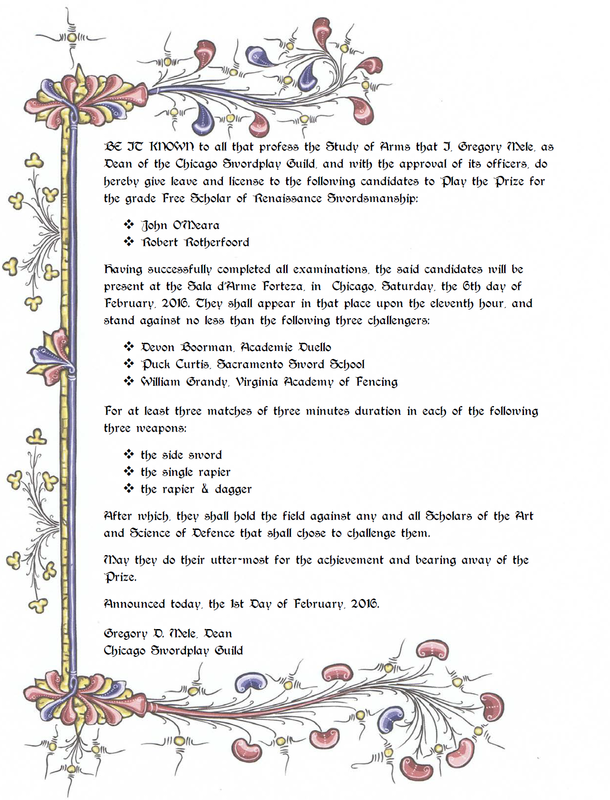 MidWinter Armizare II — This Time with Daggers, our annual contribution to the Midwest Historic Fencing League’s competition circuit is over, and I have to thank everyone involved. Last year’s event was fun, but a bit chaotic with some snafus. Our principle goals this year were to: 1) streamline the process and 2) Improve judging. I am confident we achieved both of those, although as we all know, improving judging is a perpetual process. There can be only one! 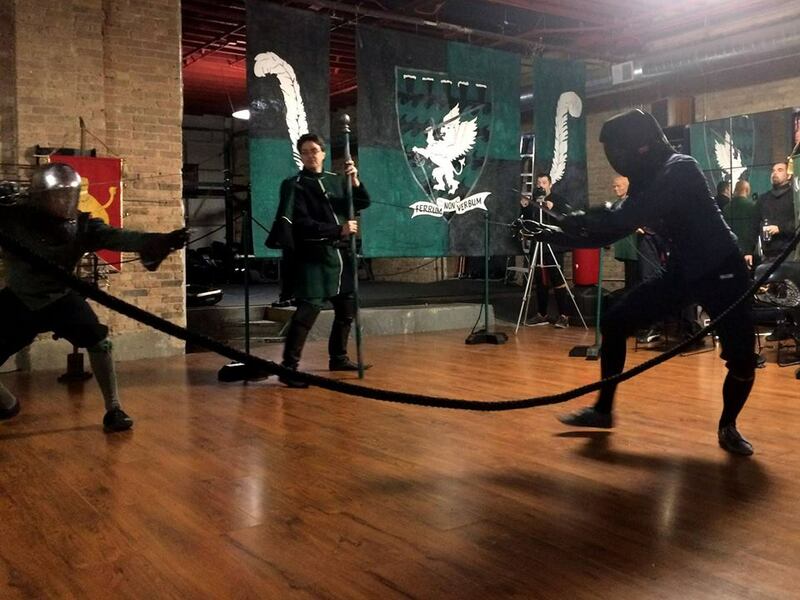 CSG’s Robert Salud (Green) delivers a passata sotto to Guildbrother Thayne Alexander in the One-Handed Sword Tournament. Tournaments are not a big part of what we do at the CSG, far less than many HEMA schools, but I *do* think that developing martial artists need a chance to test themselves against people from outside their school, outside their art. I *don’t* think tournament fighting is any more “real” or reflective of “combat” than any other fencing, in fact some ways less so. (People wear a lot of safety gear and their adrenal reflex is to be more *aggressive*, rather than more *cautious* as you immediately become when faced with sharp weapons.) But it provides a way to learn to manage adrenaline, resist temptation to play the rules, face other styles, and to learn how to use art to defeat “il uomo bestiale” the so-called “untutored fencer” of whom many fencing masters warn. Put another way, martial artists love to complain about bad sports fighting, and for good reason — combat sports really do often encourage certain gimmicks or actions that are best suited for a ring. Here’s an example. CSG’s Ben Horwitz fought his first tournament this past weekend, and was able to win his pool fairly easily against some very good combatants. I am SUPER PROUD of him. But although he wins the below fight fairly definitively in score, it wasn’t his best match martially. Six hundred years of European fencing masters say the goal is to hit without being hit, so any rule-set should reward never losing a pass, and punish double-hits ruthlessly. If the rules take more than one sheet of paper to write out, there are too many of them! Combatants will be divided into pools, fought under the below conditions, with an award to the overall victor. Longsword’s have a maximum length of 130 cm, minimum weight of 1450 g.
a thrust to the center-of-mass with the dagger. Incidental blows, light touches, flicks or hits rather than cuts, punches and open-handed strikes that do not end in a throw or lock, etc will not be scored. Combatant may carry a dagger on their belt in the longsword tournament, and switch to its use as they see fit. Daggers may only strike with the point. If a dagger hit is scored, combatants may, after the halt, switch back to their sword. Grapples that end in a throw with party dominant will score a point. Grapples that go to the ground with no one dominant will be halted. If there were any double hits during the match, both parties lose 1 pt. Therefore, in any match a combatant could score between 4 and -1 points. These rules are not meant to be “realistic”, simply to prioritize drawing first blood and avoiding being hit and, most especially double-hits. No matter how many double hits, for the sake of simplicity, only 1 pt is lost. However, additional double hits are not refought, so if you rack up too many double-hits, the victory in that match is going to go with who scored the first blow, and your overall score is going to go down! There are two ways to advance to the final round of four combatants – by Score or by Accolade. Once the Finalist are assembled, they shall fight with the prior scoring conventions in a simple single elimination tree. (NB: In the event of a small final list (four or less), the finals may be fought as a pool at the judge’s discretion. The fencing on a whole was like all fencing: some amazingly good, some…er….and a lot of bouts that combined moments of brilliance with moments of adrenal reflexes or choking under pressure. That’s how these things go, so let’s focus on the good! 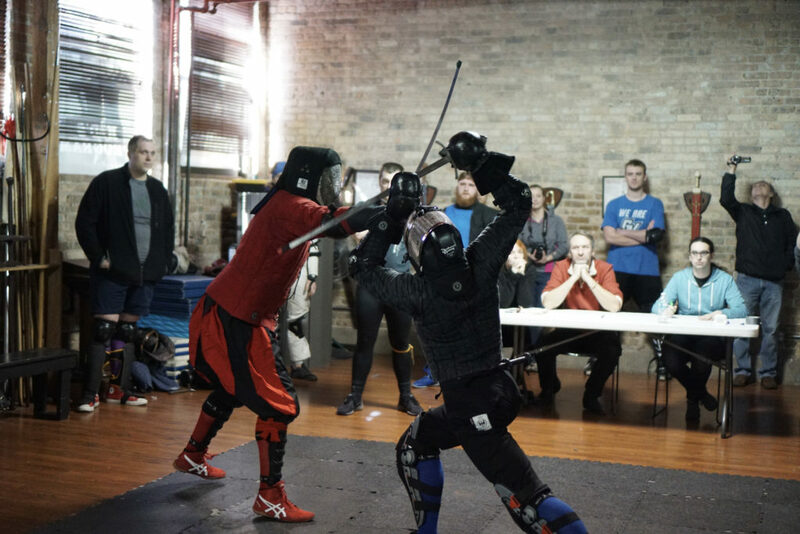 CSG’s Jesse Kulla and Adam Franti of Lansing Longsword Guild fought a real nice bout for the longsword final. Although their being tired after 6 hrs of fighting meant that there were several double hits, it wasn’t because of stupid choices, it was because of either slowed reflexes, or failing to close a line sufficiently to prevent a counterattack. The best part, however, is that these two gentlemen showed why, IMO, a combatant should always get to call a blow to his own detriment. Our judges blow an early call that would give Jesse the victory. I was pretty sure it was a double hit, but my judges were all in agreement, so I was reticent to second guess them. But Jesse and Adam thought it was a double hit too, and Jesse declined the victory. Next pass, similar issue but reversed roles and before I could make the call, Adam declined the point, and we tried it a third time. Yes, each man gave up his chance to end the fight there and claim victory — those are the character tests competition can give, far more than they test “if you can bring the heat” (whatever the hell that even means in a pretend fight). 3. I always enjoy seeing my friends Adam Franti, Keith Stratten, Josias Arcadia and Zeke Talmage fence. I was super happy to be directing their pools, and in longsword to have almost all of them all in the same pool, with my student Benjamin Horwitz, who did some of his best fencing (after I informed him I had registered him for the tournament, whether he liked it or not). I really enjoyed their pool and the fencing they displayed. 4. Additional kudos to Adam and Keith, who brought proper steel dussacks (Keith’s was barely bigger than a bowie knife) to the 1 H tournament and used them to great affect and with great form, despite knowing they were giving themselves a huge disadvantage against some of the very long, very thin bladed rapiers a few combatants were carrying. 5. Lars Olson was a fantastic in the 1 H sword list, and it was great finding out their is an armizare practitioner, not affiliated with the CSG/Milwaukee in the Midwest. Of course, as I directed just over a third of the fights, I also missed seeing a bunch of them. I really wanted to see the Sam Street (who won all three events last year), Jesse Kulla rematch, but it was not to be. In fact, I never got to see any of Sam’s fights, and only saw Jesse fight in the finals. Ah well, it’s not about me. Kaethe Doherty who wrangled the pools, created the trees and basically did all of the ugly back-end stuff before the event, and then made changes on the fly at the speed of light as we added and dropped people. Their work made the day run far more smoothly than last year. You are a rock-star. James Reilly, John O’Meara and Rob Rotherfoord directed, and James is functionally my chief lieutenant for the day of the event. Alex Moe and Joseph Doherty were score-keepers, and were fantastic at it, Alex not least because we drafted him on Saturday morning. Libby Beyreis, Robine Asamar, Heather Hilchey, Nic James Cabrera, Victor Allen Bayona, Rebecca Smith Cruz, Summer Sparacin, Alexander Shekleton, Andrew Morris, Robert Salud, Ben Horwitz and Jesse Kulla who all judged, a couple of them after being pressed into service. Alisha Workman, Jess Johnson and Dante Guinazzo who were the event “gophers”. That might not sound like an illustrious job, but GOD it helped having them! Thanks to Nicole Allen who donated one of her products from SwordGeek Boutique (which launches as an Indiegogo Thursday, but you can get a sneak peak now) as a tournament prize. Finally, every combatant I didn’t mention — everyone who attends and does so with a good spirit and gives their utmost makes the event. We’ll do some after action review, continue spending time each CSG FightNight training judges, and hopefully be better in 2019! MidWinter Armizare II — This Time with Daggers! 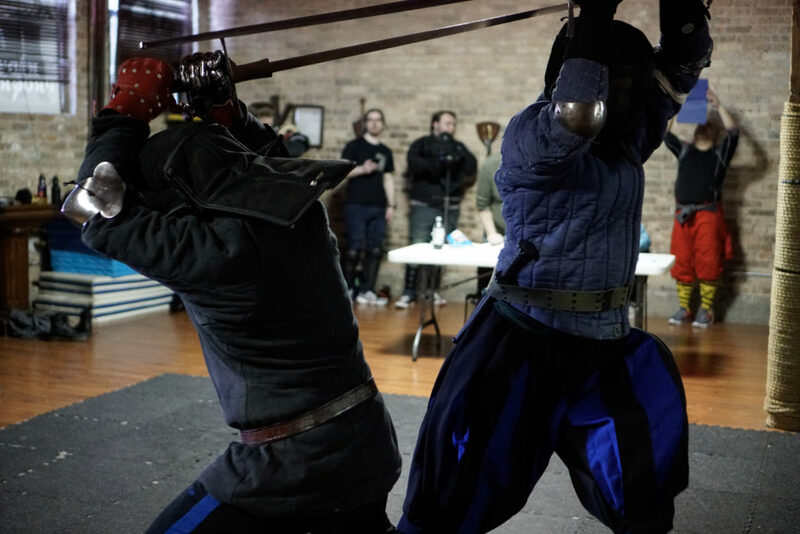 In conjunction with the Midwest Historical Fencing League and Forteza Fitness & Martial Arts the Midwinter Armizare Open is a public display of skill with one and two-handed swords in a relatively rules-light format meant to emphasize the tactical priorities of fighting with sharp weapons in lethal combat. JOINING: Registration is $50. Register online through the Forteza website. Our First Renaissance Free Scholar and first-ever Provost! 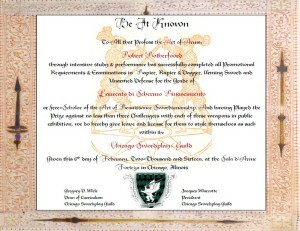 This past Saturday saw a momentous occasion for the Chicago Swordplay Guild: our second Free Scholar’s Prize and our first-ever in Renaissance Swordsmanship. The Prize is not a play, a tournament or an exam, though it has elements of them all. 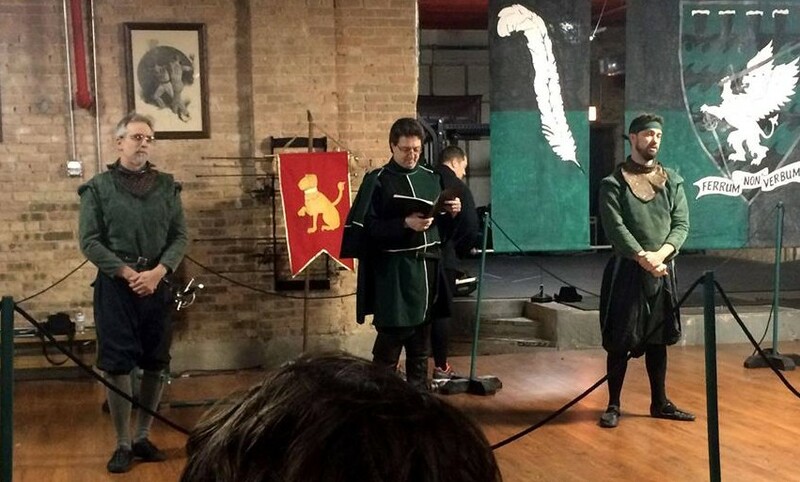 It is a right of passage whose origins extend back over half a millennia, and is the most ceremonial event we have in the Guild, as well as the most personally meaningful to the student being tested. 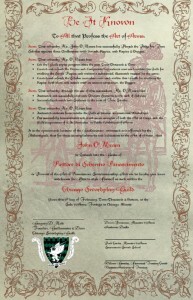 [For more information on Prizes as they were historically and used in the CSG, see What is a “Playing of the Prize”? To qualify to play the prize for Free Scholar, students have completed at least five to seven years training in the weapons for the curriculum being tested; in this case the Bolognese side sword, the rapier, rapier & dagger, wrestling (abrazare) and unarmed defense against the dagger. Physical exams in these disciplines amounted to about four hours of testing, and there was also a written exam for each. 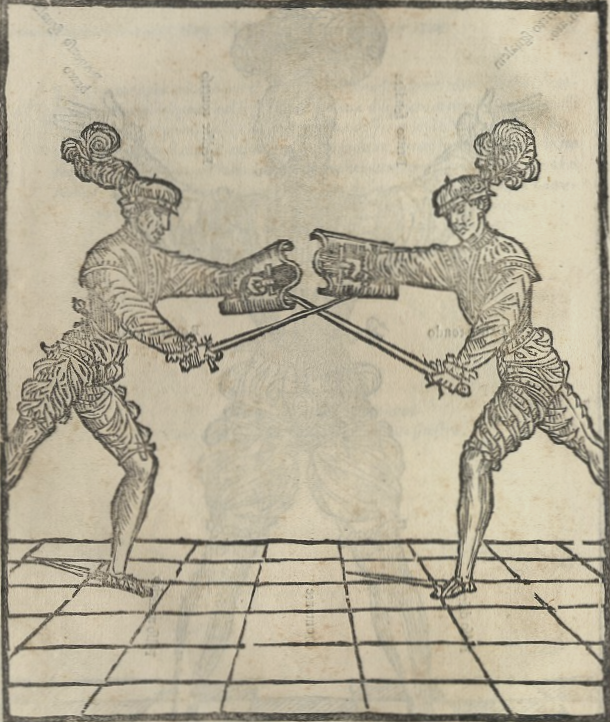 Additionally, each student is required to submit a written, research paper; here is Robert Rotherfoord’s paper on the Universal Parry and Great Blow in Bolognese fencing. Once the exams have been passed and the final paper accepted, then the Prize can be held. Bill Grandy, Head Coach of Historical Fencing, Virginia Academy of Fencing. All of these men are long-time practitioners and teachers of the Art of Defense; Devon and Bill run two of the largest HEMA programs in the world. In addition, while Devon practices the same arts we do in the CSG, the other Challengers brought surprises of their own to the table. Bill Grandy is also a longtime student of Salvator Fabris’ rapier method, and is familiar with Bolognese side sword, but his cutting-sword focus is in the German messer and longsword. Puck is one of the world’s premier exponents of La Verdadera Destreza, a system that rivaled the Italian tradition and uses a different set of strategies and tactics to achieve the same goal: pointy end into the other man. I had made these choices by design, as the idea was to make the Prizors not only display their ability to fight a like style, but to use their art against a foreign one. Disarms, grapples, leg sweeps and throws are permitted, but combat will stop once both parties are unarmed, or one is thrown to the ground. Combatants acknowledge their own blows, and the Judge intervenes only to part combatants with his baton for safety reasons or because a throw or disarm has occurred. The candidates had asked to fight the weapons in chronological order: sword, rapier & dagger and then rapier alone. It was determined that the order of challenges would be Puck third, Devon second and the honor of the first blow would go to Bill. 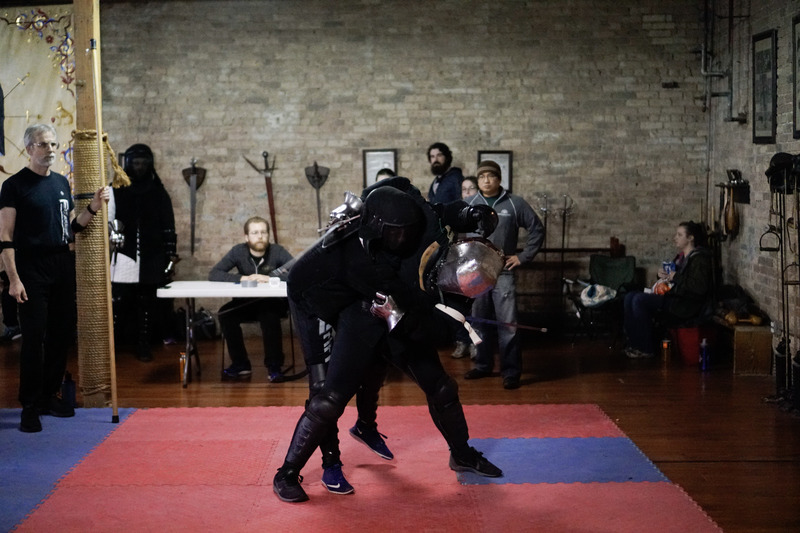 Well before their arrival in Chicago, I had been in contact with the Challengers and discussed John and Rob’s particular fencing quirks, strengths and weaknesses, so each was not only going into the list to fight them, but to test specific things, most particularly, their weak points. The first round was dedicated to the sword alone, which is Robert Rotherfoord specialty. As you watch the fights you will see that he and John use the art somewhat differently: as a rapier specialist, John gravitates towards the later style advocated by Angelo Viggiani, including the powerful use of a rising parry transforming into the punta sopramano/imbroccata (overhand thrust) made on a short lunge, or the use of the same thrust as a provocation to set-up follow on actions. John O’Meara vs. Puck Curtis Rob, who favors Manciolino and Dall’Aggochie, uses shorter thrusts and more cuts made with steps off-line. The fights were vigorous and also great fun to watch; the audience loved the dynamic elegance of the Bolognese system’s flowing, looping cuts and powerful thrusts. The second round was with the rapier & dagger, the newest part of the Renaissance scholar curriculum, and a very demanding one, as it requires constant changes of initiative while wielding two dissimilar weapons both in conjunction and separately. It can be very fast and exciting to watch, and as I personally had not seen Destreza’s version of the system, it was personally interesting to watch how it played against the “Salvatoran Art”. The rapier used alone is the first weapon taught in the Renaissance curriculum and goes back to the very first year of the Guild’s history. It is an easy weapon to understand, but a difficult one to master. Although we draw material from a variety of c.1600 sources, far and way the core of our curriculum comes from the monumental text by Master Salvator Fabris. However, as the third weapon fought, you can see the fatigue starting to kick in and the Prizors periodically retreat or come to grips just to catch their breaths, rather like “the clinch” in modern boxing. In times past it was the custom that Prizors must fight no less than three Challengers of the grade sought, before the Prize would be considered won, but that he must stand against any and all challengers who might come forth to test him. Likewise, having faced three challenges in each of the three weapons of the Free Scholar, the candidates then stood against any Scholar would would challenge them to a match of three good blows with the rapier or sidesword. You can see both fatigue and the effect of earlier cuts to the sword arm taking their toll in these bouts, as Rob drops his sword twice because his hand is getting numb. 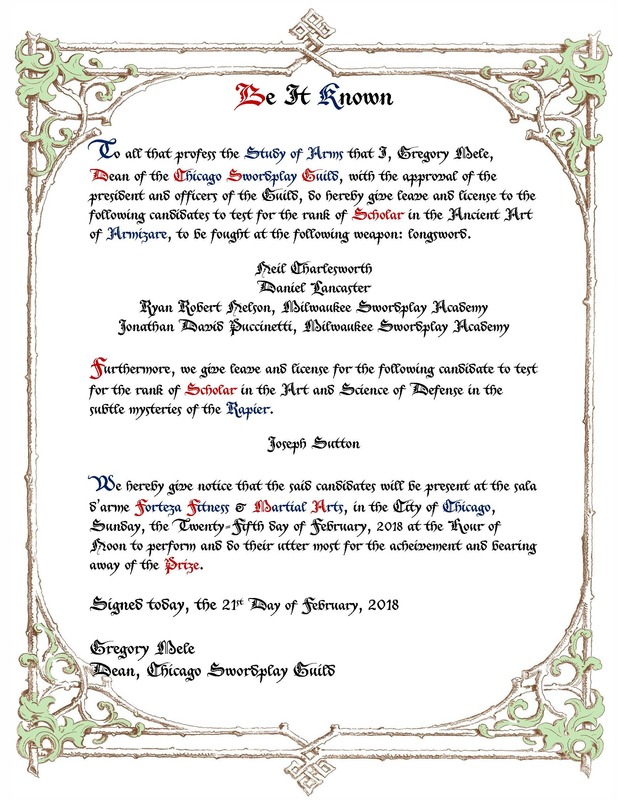 Robert Rotherfoord and John O’Meara — the Guild’s first Free Scholar and Provost of Renaissance Swordsmanship, respectively. Historically, once all the bouts were over, if the Prizor was judged victorious by the four Masters, he would be declared “a well-tryd and sufficient man with divers weapons”. He would then (after collecting the change littering the stage) swear his oath of obligation, and be escorted by his new peers back to the school and from there off to do much drinking. Fortunately, our guests felt that the John and Rob easily fulfilled the requirements of their new rank, leading to the ceremony of Investiture. 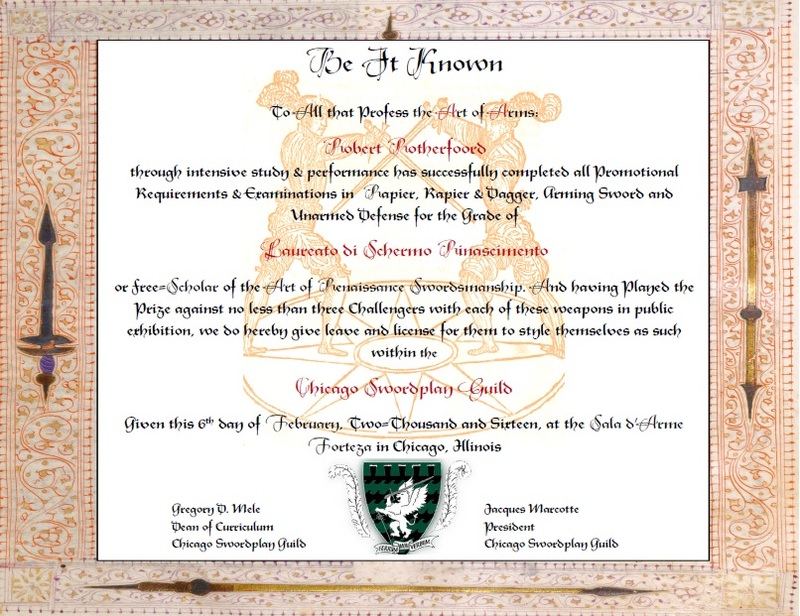 Our modern Guild’s Scholar’s oath is adapted directly from that of the Elizabethan London Company of Masters, requiring the student to treat those above and below him or her with respect, to train diligently and with pride, but not vanity, to be sure that their actions and deeds in the list or the classroom bring renown, not shame, to their fellows and teachers, and to be a good citizen. Robert Rotherfoord’s Free Scholar license. Gold was considered the noblest of metals, exceeding all others in value, purity and finesse. It represents the light of the sun, and the nobility of princes. It is also associated with excellence and achievement, and its bearer surpasses all others in valor. As such, the golden garter is a fitting symbol of a Free Scholar of the Art of Arms. We caught John off-guard and informed him that such he was about to be! This decision was not made lightly by myself or the three Challengers. 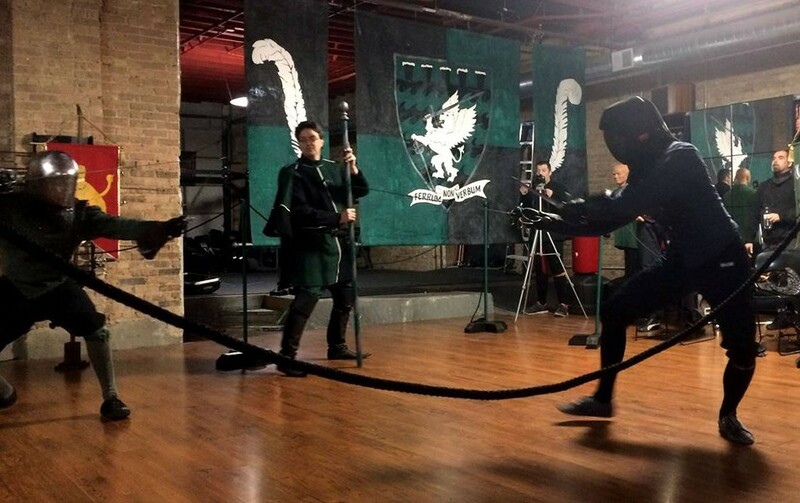 John joined the Guild in the year of its founding (1999) and has spear-headed the Rapier curriculum since 2002. Over that time, there have been many ups and downs — a steadily evolving curriculum that went through a few reboots, a seeming curse where every time new Scholars were made, life took the away from both the Guild and the Art, significant, side-lining injuries with long recovery time and more. 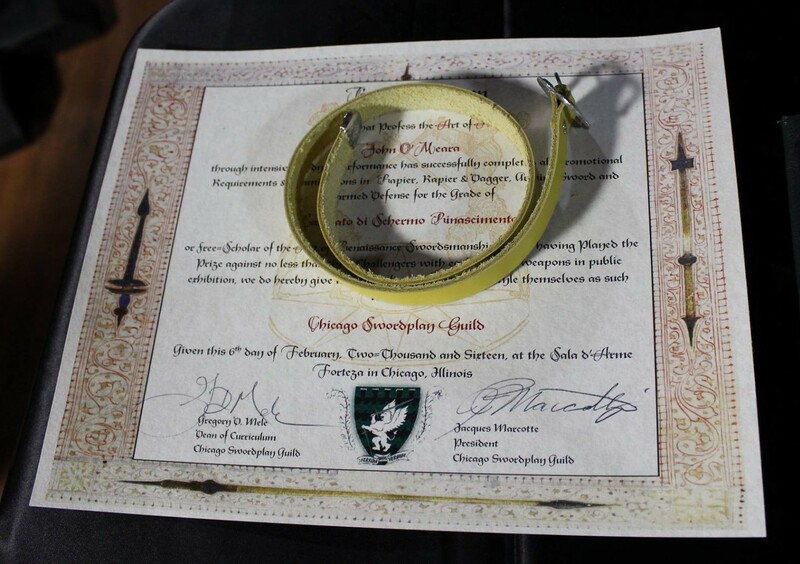 Thus, it is some how particularly appropriate that John received his rank of Provost at a time when our Renaissance swordplay program is larger and more robust than ever before. 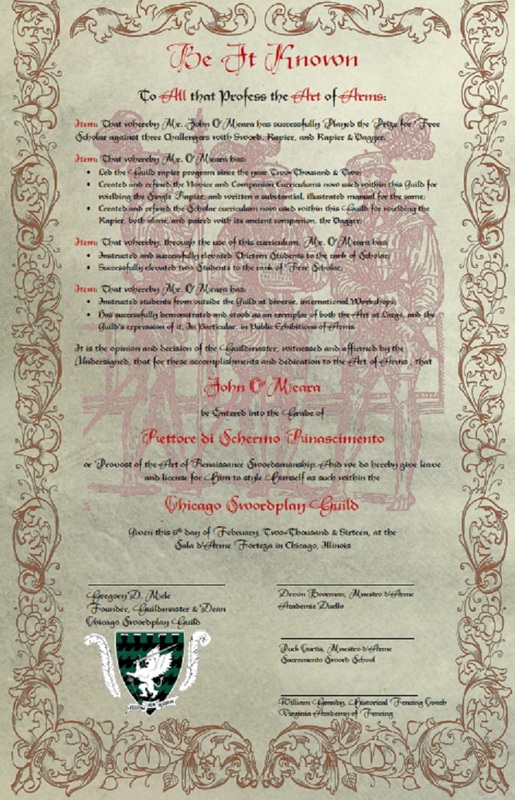 John O’Meara’s Provost license, just prior to its signing. Thus, it was my particular honor as the Guild’s founder and Dean to elevate Mr.John O’Meara as the CSG’s first Rettore di Schermo Rinascimento (Provost of the Art of Renaissance Swordsmanship). Besides the gold garter, as a Provost John was given a ceremonial chain of office; its links representing the long line of teachers who have preceded us. The chain is not whole, just as our lineage was broken long ago, but instead is closed by a pendant of St. George the Dragonslayer, paragon of chivalry, for this is a chivalric art, and it is through its values that what was broken is again made whole. In this sense, the chain becomes a fitting symbol uniting past to present, and present to future. 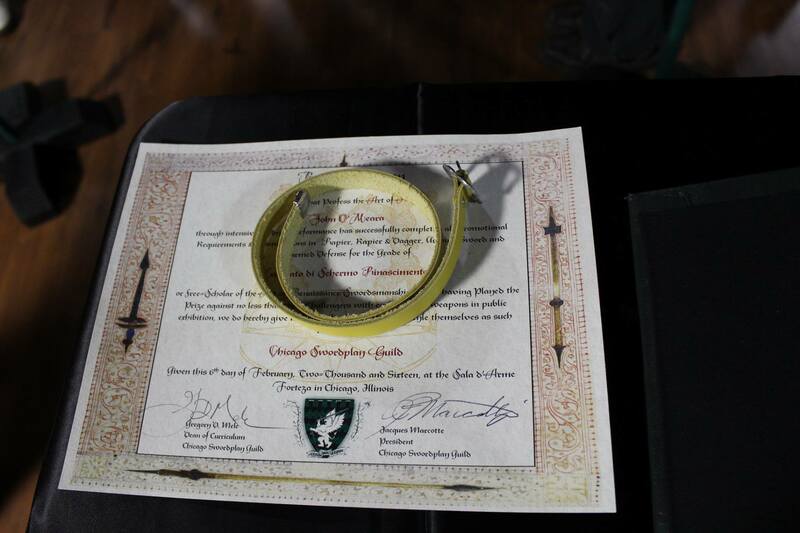 This was a truly special day — the culmination of a decade and a half of hard work as well as the inauguration of the next phase in the Guild’s history, particularly in the field of Renaissance swordsmanship. My thanks to Maestri Boorman and Curtis and Coach Grandy for attending and helping bestow the Provost rank, and to John and Rob….words cannot express my pride. Mark your calendars for September 2016, because REGISTRATION IS OPEN! 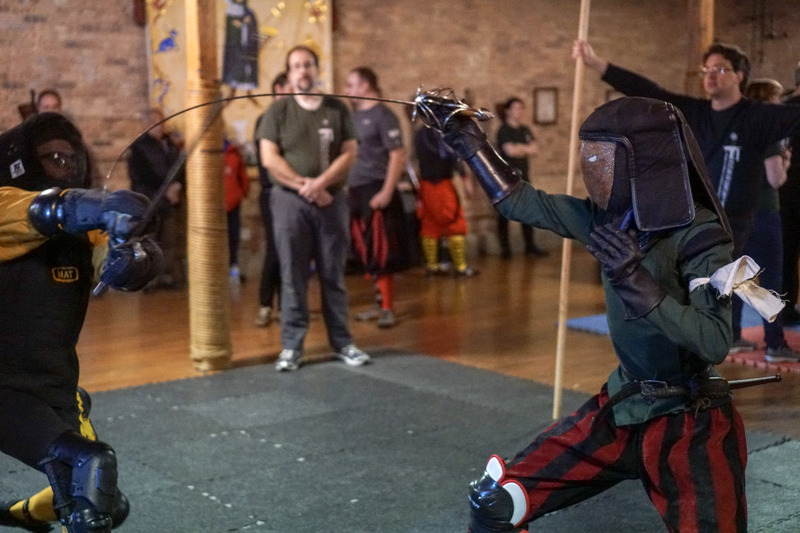 The Chicago Swordplay Guild and the DeKoven Foundation present an event celebrating the ancient & living traditions of the land that brought you Fiore, Fabris, Marozzo, Galileo, DaVinci, Casanova and … spaghetti! 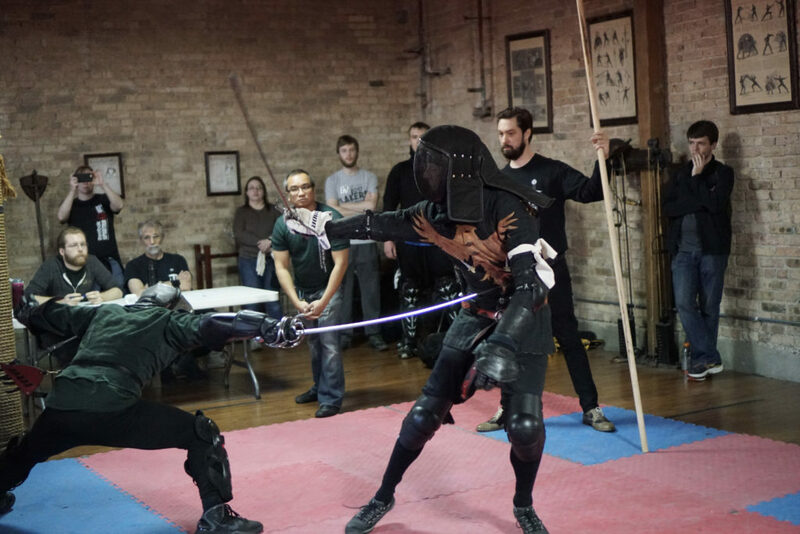 Located at the picturesque DeKoven Center, home to the Western Martial Arts Workshop, the conference is a retreat with attendance limited to the 60 students that DeKoven can host. Your registration fee includes ALL classes, meals and lodging onsite at the beautiful DeKoeven campus. This is a unique event and a unique opportunity to train in a private environment with some of the finest modern teachers of the Art of Defense. Act now, because ttendance is limited to the 70 folks we can house on site!paces will go fast. We look forward to crossing swords with you! This year we have organized classes two ways: stand alone classes on a wide variety of topics, and several themes, meant to allow either in-depth study of one topic or to show commonality throughout the breadth of Italian fighting traditions. Stick with your favorite arts or dive into a pool 600 years deep! These 3 hr classes allow an in-depth exploration of both the how and why of Italian martial arts. As much as we imagine skilled swordsman meeting at dawn, most duelists had often never fought before, and might not even be trained combatants. In these 2hr classes, students are taught what the historical masters themselves considered the “bare bones” basics of their art, in order to fight and survive. A perfect way to try something new! Every year folks who participate in the armoured deed of arms talk about how much fun it was…but also who they wish they had more time to use all of that gear they lugged across the country. Well, we listened! 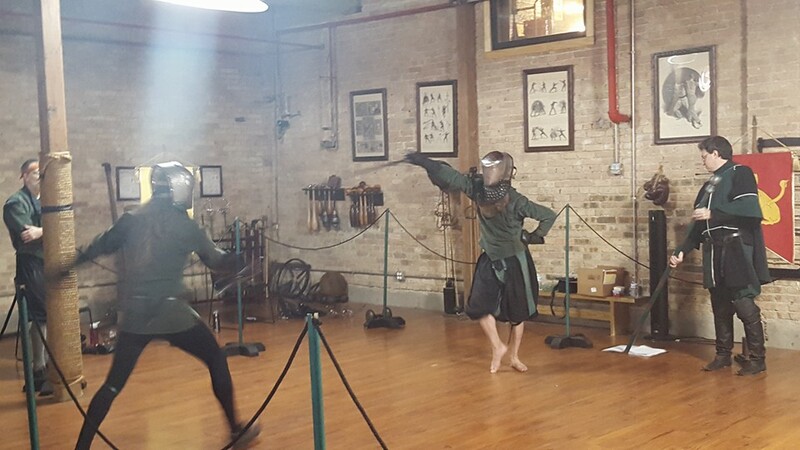 This third series, taught “on the green” (weather permitting) combines daily classes, coached fencing and lectures — and of course, the invitational Armoured Deed! Two and three hour classes on a wide variety of topics covering the 14th – 19th centuries! 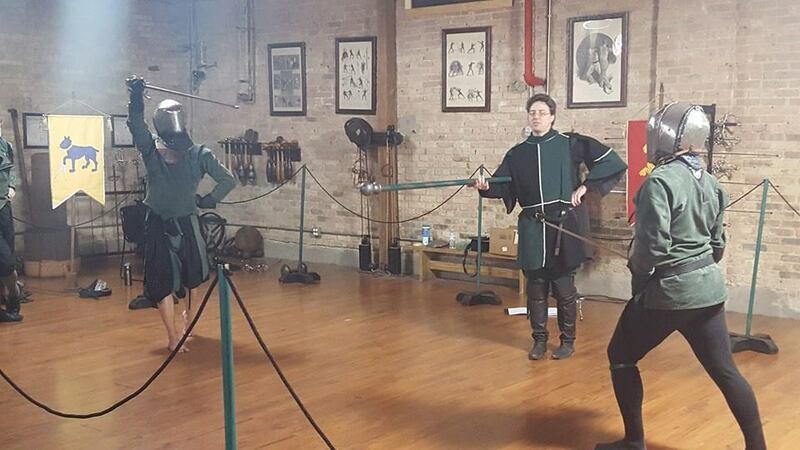 A Contest-of-Arms with Sword, Rapier and their trusted companions: the Buckler and Dagger. On campus; double and triple rooms. You will be able to request the roommate of your choice when you register, and we will make every effort to accommodate you. Lodging is from Thurs to Sat. Do you really think you know the fundamentals of Bolognese sword and buckler? And even if you do, does your body? 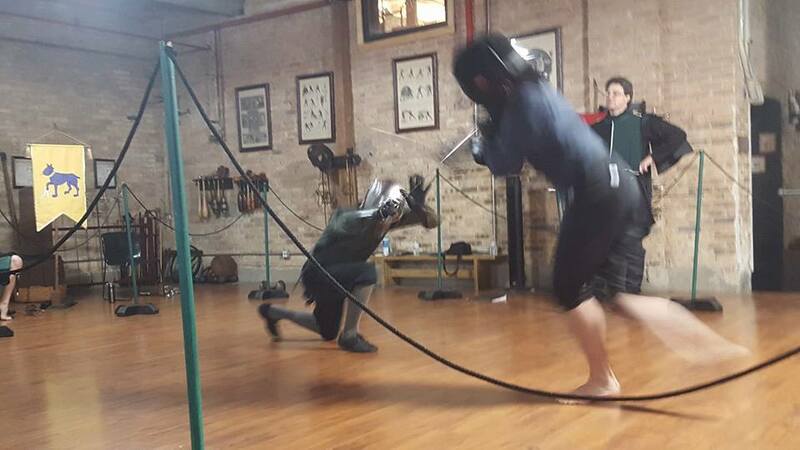 For the more experienced swordsman ambitious to firm up his basics, as well as the beginner wanting to start on the right path, this class is an intensive on what you must know to successfully tackle the actions of Manciolino and Marozzo. From precise formation of the guards to efficient, martial-looking steps; from powerful cutting and thrusting mechanics to building intent in your actions; from positive, sure parries in all lines to accurate ripostes; from entering a crossing to safely performing a take-off; from provoking tempi from the opponent to exploiting them successfully–these are the basics you will drill in this class. In addition, you will learn how to use your off-hand weapon (the buckler) as taught by the great Bolognese masters. The main goal of this class is to let you develop a sense of mechanical precision, outward elegance (looking like the book), and effortless sprezzatura in the style of the men who invented the word. In this class, you will have a chance to bring your favorite weapon and truly understand the concepts of gioco largo and gioco stretto. 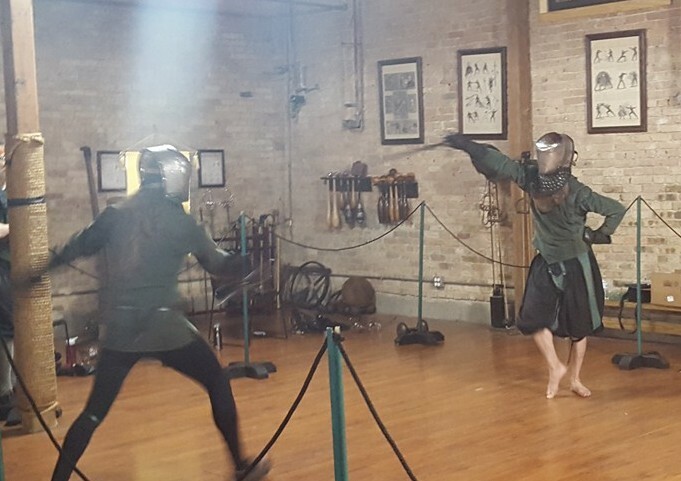 Bring your single-handed sword with or without buckler, and your medieval longsword or spadone — you will be using them both! As the masters say, failing to understand the narrow play may put you in the position of being chased around by the opponent, while you flee across the salle fearing what lies beyond the safe confines of wide play. It’s not enough to find and control the opponent’s sword, we also have to keep control of our own. And what if he finds us first? 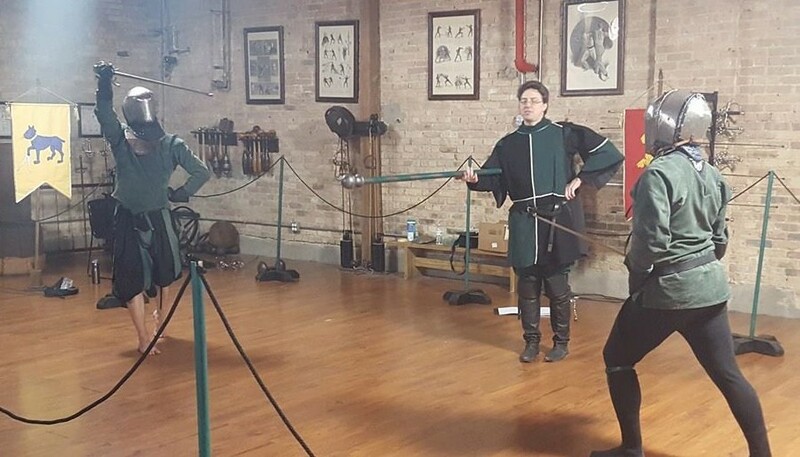 Here’s how to keep the advantage in the Italian rapier fight, regain it once it’s lost, and avoid the “contendere di spada” (aka the “death bind”). Students in this workshop will explore the tactical environment of the larger rotella and how to maximize the benefit of its cover while accommodating for the greater constraint it puts on the maneuverability of your sword. 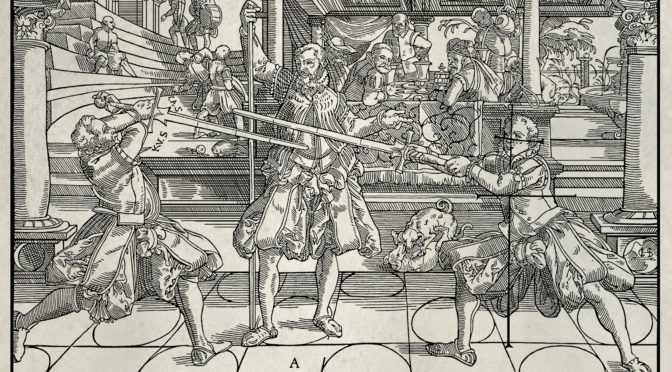 It was only late in the 17th century that fencing began to separate into the ars militarie and those of self-defense; the well-rounded swordsman of the 16th century was expected to have proficient with all manner of arms. This included the sword used with a variety of companion weapons, but also the two-handed sword, polearms and at least the basics of close combat. In this short class we will look at one of the most common, useful, and for modern students – fun – polearms of the Bolognese tradition – the partisan. A massive, winged slashing spear, the partisan, whether used alone or with the rotella, was a both a common weapon of the battlefield and routinely appeared in the lists for use in a judicial duel. In this short class we will look at the fundamental guards and defenses of the weapon, how it combines cuts and thrusts in a way similar to the sword alone, and learn several plays taken directly from the works of Antonio Manciolino and Achille Marozzo. Please bring either a partisan or a 7 – 8′ spear, with the last 18″ (Including the point), marked to represent the cutting edge. We will have some additional weapons on hand for those traveling by plane. Many Italian practitioners are making mechanically and tactically weak choices in their positions but are not having those positions challenged in a manner that leads to the development of truly effective technique. In this class we will explore the mechanical and tactical side of stringere, how to make positions that are truly sound and how to view and exploit positions that are weak. For years, Carranza has been called the father of Spanish fencing. Recently, estranged uncle Godinho has returned to shed some light on the tales that brother Pacheco has been telling about his vulgar cousins and grandparents, and it turns out they’re a much closer family than previously thought. The similarities and differences between the “true” destreza and the “common” destreza will be explored in order to understand the state of Spanish fencing from which Carranza created his method, as well as its possible origins. Recognizing the relationship between these styles will lead to a broader understanding of what Spanish fencing really is. In 1599, maestro Domingo Luis Godinho wrote that although the three double arms (sword and rodela, buckler, or dagger) are distinct, their play is not. This class will be in two parts; the first will build the necessary foundation of sword alone in the common Spanish style, and the second will integrate your companion weapon of choice: rodela, buckler, or dagger. Bring your favorite and learn how to fight in the common Spanish style, or bring them all and learn how the use of one translates to the use of the others. Starting from the initial approach, to crossing safely into measure, tactically controlling the opponent, finding the right moment to strike, and concluding with a safe exit. Students will explore the fundamental flow chart of the Italian and Spanish tactical approach to the rapier at each stage and readily conclude that the Italian masters had a far better handle on what they were doing. In this class students will enjoy a crash course in the Atajo within a variety of contexts from simple to extreme. In addition, we will examine ways to escape and reverse the atajo in order to open up a new tree of fencing actions taken from an initial position of disadvantage. All of these actions will be coupled with a friendly dose of violence certain to delight your friends. No experience required. Bring mask, single-handed training sword, gloves, and a padded jacket. From Portugal comes a Carranza-based form of Destreza which challenges Pacheco’s authority while also integrating beautifully with his work. In these pages we see a simple and effective sword and dagger system to complement the existing single-sword material. What happens when you pull out a dagger for your left hand in the streets of Madrid at midnight? Find out here. According to maestro Luis de Viedma, the montante is a weapon of little courtesy, and with it a man is forced to defend his life without having respect for anyone. Forget fighting in narrow streets. Forget breaking up fights. Forget guarding a lady or your damn cloak. This weapon is for driving your adversaries before you. Outnumbered? Surrounded? Facing shields and polearms? You’ve got a montante; time to show them what it was built for. The true mark of an experienced martial artist is excellent timing and La Verdadera Destreza’s method of stealing the place from your adversary is the diestro’s playground. In this class we will use the adversary’s movements and footwork against him to develop our assaults at his expense. This class will be particularly useful if you often fight with a reach disadvantage. Some beginner level experience recommended. Bring mask, single-handed training sword, gloves, and a padded jacket. The Belgian nobleman Jehan L’Hermite, during his time in Spain, learned the use of two swords from the maestro mayor Pablo de Paredes in 1599, recalling that it consisted of very beautiful turns in good order and step, with which one defends himself and offends the enemy, learned in rules. The same year, maestro Domingo Luis Godinho wrote a manuscript containing rules for two swords which match that description. Students will learn some of these rules and their applications against being surrounded, guarding a cloak, and others.